Stress fractures of the foot are rare in professional football but are known to cause long absences from the game. All bones of the lower extremity can be affected; however, load-bearing bones are more often involved in football. Navicular and fifth metatarsal bone stress fractures (in particular) show a high risk of delayed union and non-union. Recurrent submaximal loading with inadequate recovery are most likely among the major contributors; however, this chapter will also cover several other intrinsic and extrinsic risk factors that should be screened. Delayed diagnosis of stress fractures of the foot can lead to unsatisfactory results. A high index of suspicion, without delay in further investigation, is mandatory. Initial treatment consists mostly of activity/load modification and rest. Early surgical intervention is indicated in case of “high-risk” fractures that are prone to displacement or non-union. 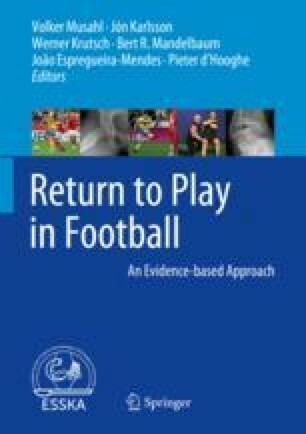 This chapter will focus on the specificities of football-related foot stress fractures and show how proactive management can lead to good results and early return to play.